← Attention Orland Park Moms! 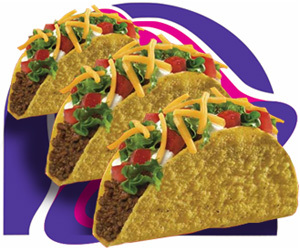 According to a lawsuit filed recently against Taco Bell, the “beef” served there is not 100% beef. Well, one only has to look at a Taco Bell taco to figure that out. The meat has a creamy texture that cannot be achieved with beef alone. I laughed when I first heard this story on the news just because it seemed like another frivolous lawsuit that we have all grown accustomed to hearing about. As long as they are forthcoming with all of the ingredients that are added to their beef so that those who have food allergies can be aware, I do not see what the big deal is. Taco Bell president Greg Creed rejected the claims that they are not using 100% pure beef. He said they plan to take legal action against those making the allegations. This story may have affected me more back in the day when Taco Bell was a regular staple in my diet. Now, not so much. In other local beef news……Fatburger on Lagrange here in Orland Park has closed its doors. I for one am not surprised. When they first opened their doors in August of 2008 there was initial interest because Kanye West was opening a burger joint here in town. Then that interest was replaced with sticker shock when you ordered a burger “value meal” that consisted of a burger, fries and a drink and your total was an astounding $9. Now, if this burger was superb in any way to justify the price…but no, it wasn’t. For those of you who are mourning the loss of our local Fatburger, fear not, there is another location in the Beverly area and according to Fatburger Corp. CEO Andy Widerhorn, they are looking for a replacement site right here in Orland Park.